Here are some scooter safety tips you can use to stay safe on gas scooters. Driving gas scooters isn't that hard if you can ride and balance a bicycle and you know which scooter laws apply. Still, there are some basic tips that can help you ride safely, especially if you've never driven a motorized 2-wheel vehicle before. What you need to remember is that when you ride a scooter, there is no protection between you and another vehicle or you and the pavement, as there is with a car or truck. If you have an accident, there's a high likelihood that you'll be injured. So your best bet is to avoid the accident in the first place. Maintain your visibility. Wearing brightly colored clothing or a bright helmet can help. Of course, if you drive a red, orange, pink, or yellow gas scooter, you're going to be more visible than someone driving a black, silver, or white one too. Maintain a position in your lane that gives you maximum visibility from other drivers. Try and stay in the rear view mirror of the car in front of you by staying to the left of your lane, close to the line. Don't ride in a driver's blind spot if you're in a double-lane road. Drive defensively. Be aware of the drivers around you, as well as other moving objects such as bicycles, pedestrians and animals. Don't assume they see you. Anticipate collisions and have an avoidance strategy planned out, just in case. And keep your fingers near your brake levers at all times. Maintain a safe distance between you and the vehicle in front of you. This not only helps you avoid the other vehicle, should they brake or stop suddenly... it also gives you room to spot obstacles in the lane ahead of you in enough time to avoid them. Only drive when your mind is clear & focused. Driving gas scooters requires sharp, quick thinking at all times. Never drive under the influence or when you're distracted by emotional upsets. Make sure you can focus fully on the task at hand and make snap judgments. Helmet. Your state may or may not require helmets, and I'm not here to comment on how helmet laws impinge on our personal freedoms... as a nurse, I've seen firsthand the effects of a traumatic brain injury from bike, motorcycle and scooter accidents. They're not pretty. Wear a helmet if you care about your future. Half helmet, 3/4 helmet, full helmet... it's up to you. Just wear one. Gloves. Leather gloves are traditional, but there are new models made of cordura nylon or similar fabrics that can provide similar protection, but keep your hands cooler. Gloves will protect your hands from the pavement in the event of a fall; they also provide warmth from the wind and rain. Warm, closely woven jacket. A scooter jacket is an essential part of your protective gear too. Tough nylon or canvas work well, as does leather and heavy denim. Windbreakers and fleece may keep you warm and/or dry, but they won't provide much protection if you fall. Long pants made from tough fabric. Jeans are probably the most common pants worn by scootin' folk, but leathers work too. You might be tempted to wear shorts on hot, summer days, but I wouldn't advise it. Sturdy shoes or boots. Be sure you wear something that provides good protection for your feet AND a solid, stable surface to stand on at traffic lights and stop signs. Flip flops and sandals are not advised. 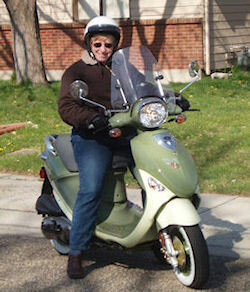 Maintaining scooter safety really just requires a little common sense, confidence and skill in driving your gas scooter according to scooter laws, and the right gear. You can do it! Do you know how to winterize your scooter? Tell us (or read) some motor scooter stories of adventure!